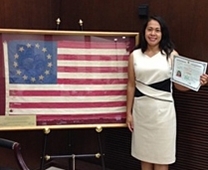 Pictured: After taking her oath, Great Plains Literacy Council learner Susan Simons proudly holds her U.S. Naturalization certificate by a historic American flag. The literacy community has seen a growing number of students who are English language learners. a connection between this vital group of immigrants and their public libraries. The process of becoming a U.S. citizen is often complicated and overwhelming, especially for non-native English speakers who don’t know where to begin seeking information, resources, and language skills help. "When you don't know, it's like everything is dark. It's hard. It's hard," said Kimly Pang, a Cambodian-born mother of three who moved to Altus, Oklahoma, with her family in 2009.
skills with Mrs. Coppock while Soknan is now attending the University of Oklahoma. Pang and her husband became the owners of the local Ye Olde Donut Shoppe and Bakery, where she began practicing her English with friendly customers. It was from a customer that she learned of the free English and citizenship tutoring available at the Altus Public Library through the Great Plains Literacy Council, a provider of literacy programs in partnership with and with funds from the Southern Prairie Library System and the Oklahoma Department of Libraries (ODL). To meet Oklahoma’s increasing demand for services to non-native English speakers like Pang—including growing Hispanic and Asian-Pacific communities—the ODL recently launched a citizenship and immigration pilot project to help libraries provide accurate and useful information about immigration and citizenship benefits. In collaboration with libraries and literacy programs in surrounding communities including Altus, the program also seeks to promote an awareness and understanding of citizenship while reinforcing English language skills. For many new to the U.S., libraries serve as a gateway to English language learning, civic engagement, and even citizenship. More than 55 percent of new Americans use the public library at least once a week. They find a trusted environment, community connections, and resources including educational and training materials on immigration and citizenship. The Oklahoma Department of Libraries’ immigration and citizenship services program is funded through Library Services Technology Act (LSTA) Grants to States funding from IMLS. Last year, IMLS announced a national collaboration with the United States Citizenship and Immigration Services (USCIS) to enhance the resources available in libraries throughout the country and strengthen the ability of librarians to guide new immigrants to the most accurate and current information available. Library staff and instructors use the USCIS website for civic interviews, flashcards and tests, and other print and online resources. Under the ongoing project, participating libraries will also establish “citizenship corners,” where information will be readily available for patrons. As part of the project, the Oklahoma Literacy Resource Office also facilitates meetings between the Dallas-based USCIS community relations representative and Oklahoma pilot site representatives to answer questions, address concerns, and share best practices. The next session is scheduled for November 17th at the Oklahoma Department of Libraries. Winters says some patrons seek assistance renewing their green cards, while others look for general information. English literacy continues to be a key priority for the library system, which uses relationships with local employers, churches, and volunteers to connect with potential students. The literacy council offers both day and evening classes, and tutoring even takes place at businesses and the local air force base. Since beginning her ESL and citizenship lessons in 2012, Kimly Pang has become a U.S. citizen and close friend to her tutor, Daina Coppack. Even though her work at the donut shop requires her to rise at 3 a.m. daily, she continues her weekly sessions to work on reading, writing, and spelling—and her reading comprehension has jumped two grade levels. In an interview with local television station KSWO in September, she said that it was the compassion of the tutors and the will to learn that keeps her coming back.